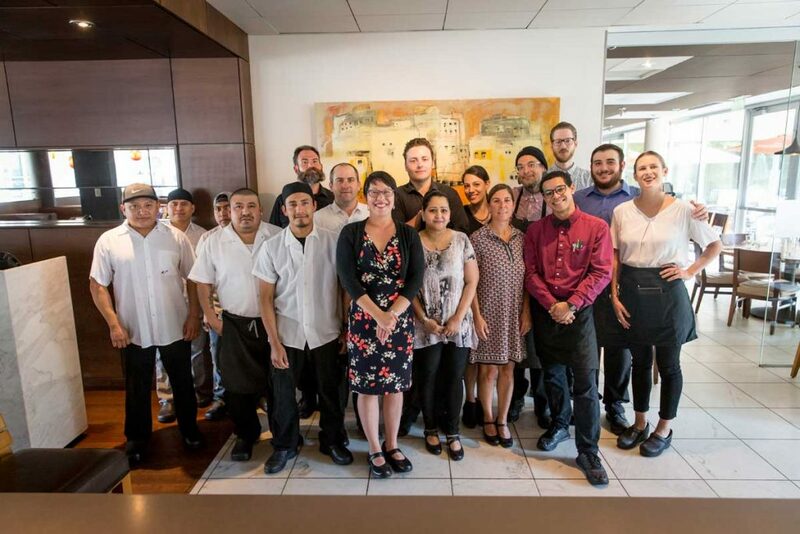 We’re delighted to announce our downtown Portland restaurant, Nel Centro, was named by The Oregonian as a Top Workplace for 2018. This is a clear recognition of the hard work and commitment to a positive and professional workplace that the Nel Centro crew exhibits every day. Our thanks go to them, and to our guests, for their continued support. We open on September 12. One of the city’s most anticipated restaurants opens tomorrow: Tanner Creek Tavern will light the burners to serve globally inspired plates by chef Trevor Payne (Olympia Provisions, Little Bird Bistro) at 875 NW Everett St. As the photos below reveal, the 5,000-square-foot space adjacent to the new Hampton Inn Suites has a commanding atmosphere overseen by an open kitchen, with a 28-seat circular bar at its heart. 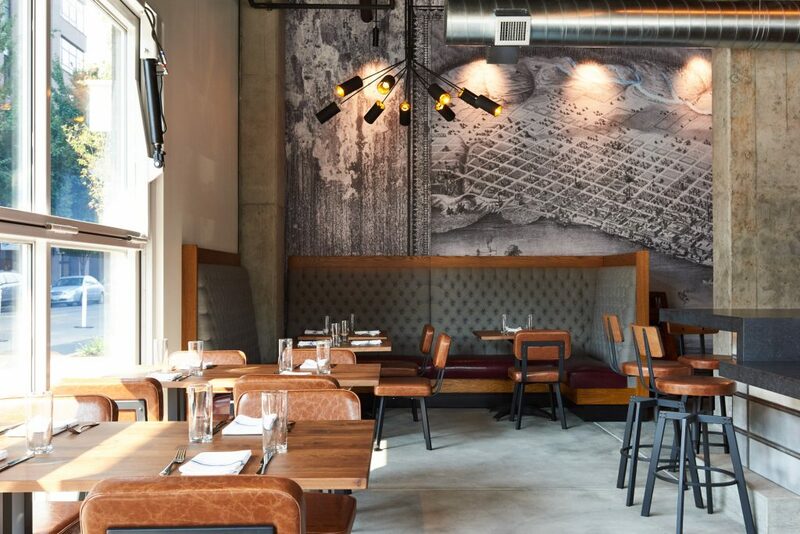 Along with lots of concrete, steel, blond wood, and natural light, Tanner Creek’s defining element is a black-and-white wall mural of the restaurant’s namesake Tanner Creek and tannery, built in 1845 in the nearby Goose Hollow neighborhood. The restaurant’s lounge area seats 48, with 66 seats in the dining room. Tanner Creek’s full menus are now on the website. The dishes come in a wide range of styles, from power-lunch showstoppers to breezy salads for a relaxed afternoon with a glass of wine. Along with a daily seafood special, Tanner Creek provides upscale offerings like harissa-stewed clams with fried potato and roasted fennel; eggplant tortellini with tomato butter and smoked ricotta salata; and grilled coulotte steak and braised shank with fingerling potatoes, beef jus, and English Stilton. The wine list centers on South America, with many options from Chile, Argentina, South Africa, Australia, and New Zealand. Tanner Creek Tavern opens for dinner seven nights a week tomorrow, September 12. It will add happy hour on Tuesday, September 19, and lunch will launch on September 26. Tanner Creek Tavern, named for a creek that flows under the condo-rich neighborhood, will open Tuesday, September 12 in new construction alongside the Hampton Inn Suites. The Portland Business Journal‘s Jon Bell talks with restauranteur and chef David Machado. Read the entire September 7, 2017 article is below. In advance of the opening of his next restaurant, Tanner Creek Tavern, the renowned Portland chef talks Pazzo, Nel Centro and how the affordability issue is starting to shape the local food industry. A few years ago, David Machado took his wife and three kids on a trip to San Francisco, a sort of revisiting of the chef’s former stomping grounds. During that trip, the Portland restauranteur’s kids went and saw a few rock shows at a club called Bottom of the Hill, which sits at the base of Potrero Hill. It was a name and place that Machado knew well: In 1986,, he and his wife, Julie, opened their first restaurant in the same building. It’s name? Bottom of the Hill. “We were like, ‘Look, kids — That’s the place where Mom and Dad had their first restaurant,’” Machado said. That Machado’s imprint on San Francisco is still visible, albeit in an altered form, mirrors some of the impact he’s had here in Portland, as well. Born and raised in Massachusetts, Machado made his way west in the mid 1970s seeking “freedom and self-expression” — “The usual suspects, the usual activities,” he said — before attending the California Culinary Academy. 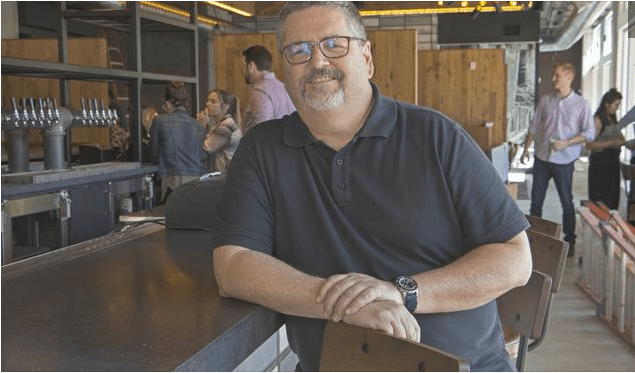 He came to Portland in the early 1990s to open Pazzo Ristorante for Kimpton Hotels, and later made big marks with Lauro Kitchen on Southeast Division, the business lunch go-to Nel Centro and, most recently, Altabira City Tavern atop the Eastlund Hotel. In advance of his latest endeavor, Tanner Creek Tavern, which is set to open in the Pearl District at Northwest 9th and Everett on Sept. 12, Machado talked with the Business Journal Portland’s renowned culinary scene. Lauro was a pretty big jump for you when it opened on Division in 2002, when there wasn’t much to that street. I honestly leased that space because of the cheap rent. I was looking for a warehousey, high-ceilinged corner space and that’s where I found it. We were the first on the street. Lauro’s idea was to take the food values and the service points of a downtown restaurant and put it in a neighborhood setting. It turned out to be very, very successful. What about Nel Centro? How did that become such a popular spot? I was terrified, because (2008 and 2009, when Nel Centro opened) were the two worst years of the Recession. I had run big downtown restaurants, so I knew the upside but I also knew the downside. We were at the bottom of the Recession, and my reasoning at the time was that we couldn’t go any lower. We could only go up. I’ve also learned to analyze these deals as to who the potential customers are. A lot of restaurants, they have great food, a great name, great ideas. Those are all important, but I need to know who eventually is going to come and dine there. And what happened at Nel Centro was that the businesspeople came for lunch, then after work, office people came and then arts patrons with tickets to shows came. They all filled it in and made a tremendous business model. You’ve never had a restaurant in the Pearl District. Why now? I have always been a little bit apprehensive and cautious about the Pearl. I know it’s gone through some starts and stops. I always saw it as a neighborhood that was being laid out and developed before my eyes. I didn’t think it had the cachet of Alberta or Mississippi or Division or an organic, existing neighborhood that’s been retrofitted for re-use. But I don’t feel that way anymore. There’s activity on the street, people coming and going, low crime. It has that as its basis, and we will participate in that. You opened your first restaurant for Kimpton in Portland more than 30 years ago and have opened several others along the way. What’s different now? I think back then, there were more chains, and now we are very anti-chain. I always look with amusement at large developers who recruit them. It’s like, do yourself a favor and don’t make that deal. Footprints are a lot smaller now, and I think the dining public has really increased its knowledge. Social media has also really changed the landscape dramatically. Have you seen the affordability issue impact the restaurant business here? We are looking at the contraction of the labor force while we are seeing an expansion of the industry. We are looking at a complete non-sequitur in that restaurants continue to open and leases continue to be signed and people continue to dine, but we are at a low ebb of labor. I don’t think we are where San Francisco is yet, where you have to live out in East Bay or South Bay and take the train or BART to your job because you can’t live close-in. Here, we are still in a roommate situation, but I think we are in the last vestiges of that. We have not definitively moved over to, ‘I have to live in Hillsboro or Gresham in order to work in downtown Portland,’ but we’ll be there soon. 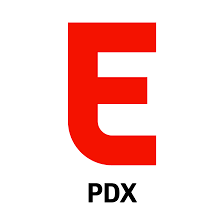 What do you think has been your impact on the Portland food scene? A hell of a lot of cooks have come through the kitchens that I’ve run at places like Red Star, Pazzo, South Park, who are still out there working in the profession. I’ve never been an innovator or, in all humility, a highly creative person. I look more to historical recipes and a faithful duplication of those recipes as they were intended. I think Lauro came at a time of change, with that size dining room and the open kitchen and bar. That is something I think I was instrumental in establishing. How long has it been since you’ve been a head chef? Today. I’m going over to Altabira to sit down and look at the menu. I’ll never stop. I’m more like editor in chief now, but I’ll never stop. Anybody who says they’re in a kitchen actively in their sixties, as I am, is either a liar or a fool, cause it’s not true. It’s hard work. It’s a construction job with knives and fire. 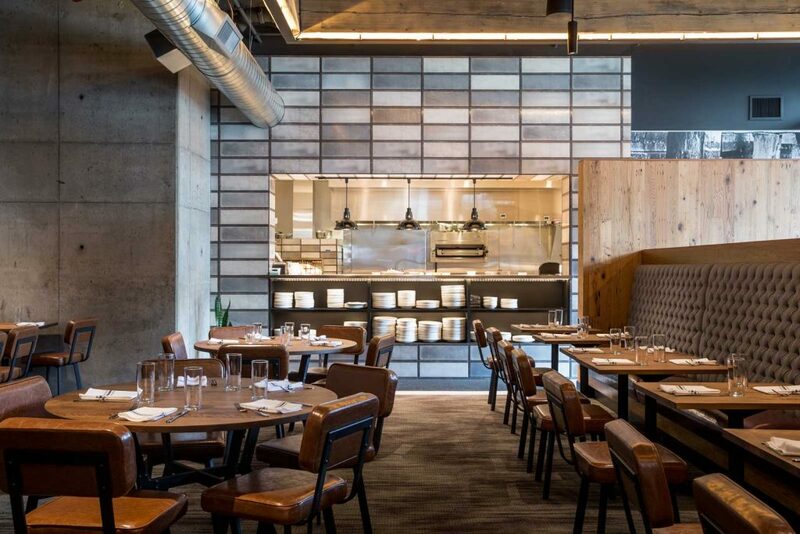 Next restaurant: Tanner Creek Tavern inside the Pearl District Hampton Inn & Suites. David Machado Restaurants will launch its latest project, Tanner Creek Tavern on Tuesday, September 12 at 4:00 p.m. The restaurant is located at 875 NW Everett St. at the corner of NW 9th, adjacent to the new Hampton Inn Suites. Chef Trevor Payne leads the kitchen, bringing 15 years of experience at some of Portland’s most celebrated restaurants, including Olympia Provisions, Little Bird Bistro and Taylor Railworks. His menu for Tanner Creek Tavern emphasizes upscale yet approachable cuisine inspired from around the globe. Starters include harissa-stewed clams with fried potato, roasted fennel, and toast; flatbread with black-eyed pea hummus; and rabbit liver mousse with smoked honey, salt and carrot pickles. The dinner menu features eggplant tortellini with tomato butter and smoked ricotta salata; roasted chicken Tikka Masala curry with Carolina Gold rice; and a grilled coulotte steak and braised shank with fingerling potatoes, beef jus and English Stilton. Full menus can be found on tannercreektavern.com. Tanner Creek will also feature a daily fresh fish special, a signature offering at Machado’s other restaurants, Nel Centro and Altabira. 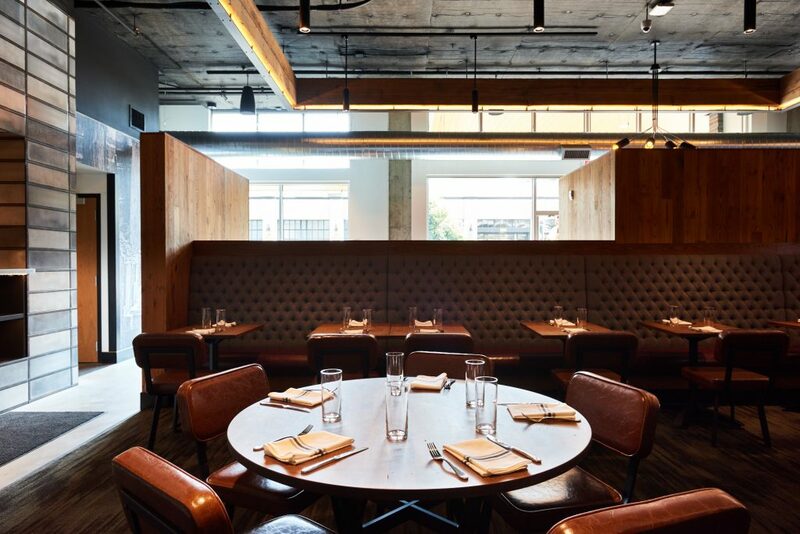 The 5,000-square-foot restaurant splits space evenly between the 28-seat bar and 48-seat lounge and a dining area that seats 66 in full view of the open kitchen. Dramatic large-scale black-and-white murals of historical images referencing Tanner Creek and the old tannery built in 1845 stretch across the walls. Other décor touches include merlot, coffee and cream hues complemented by concrete, natural wood, steel, Douglas Fir beams, tile and floor-to-ceiling rolling glass garage doors. Wine consultant David Holstrom is steering Tanner Creek’s wine program in a global direction, introducing southern hemisphere vintages rarely seen on Portland wine lists. Expect to see Chile, Argentina, South Africa, Australia and New Zealand represented, with by-the-glass prices ranging from $8-12. Southern Oregon wines will be highlighted, with bottles from Abacela Vineyards and Reustle Prayer Rock Vineyards. Daren Hamilton will head the front of the house as general manager. A 38-year veteran of the hospitality business, Hamilton has managed Portland institutions such as Bluehour, Serratto and Pazzo. Tanner Creek will mark be his sixth opening in his long-running partnership with David Machado. Tanner Creek Tavern is a new restaurant located in the heart of Portland’s Pearl District. Tanner Creek Tavern is online at tannercreektavern.com, on Instagram @tannercreektavern, on Twitter @tannercreekpdx, and Facebook at www.facebook.com/tannercreektavern. The Portland Mercury (Chad Walsh, August 25, 2017) reports on our much-anticipated September 12 opening with some mouth-watering hints about our new menu. Read the entire article in The Portland Mercury here. Machado is known for not putting the cart before his horses when it comes to determining what menu items he’ll feature. In general, he determines what a specific neighborhood has and what it lacks and goes from there by working in the kitchen with his executive chef to see what sticks. But with opening day just days away, the menu has been dropped. Expect a modern pub menu featuring deviled duck wings (we’re wondering what this means, too, but it sure sounds good), confit pork shank with white beans, bacon and a creamy salsa verde, coulette steak with fingerling potatoes and stilton cheese and, of course, a pub burger with homemade steak sauce, gruyere and fried onions. Who to track for the fall season? 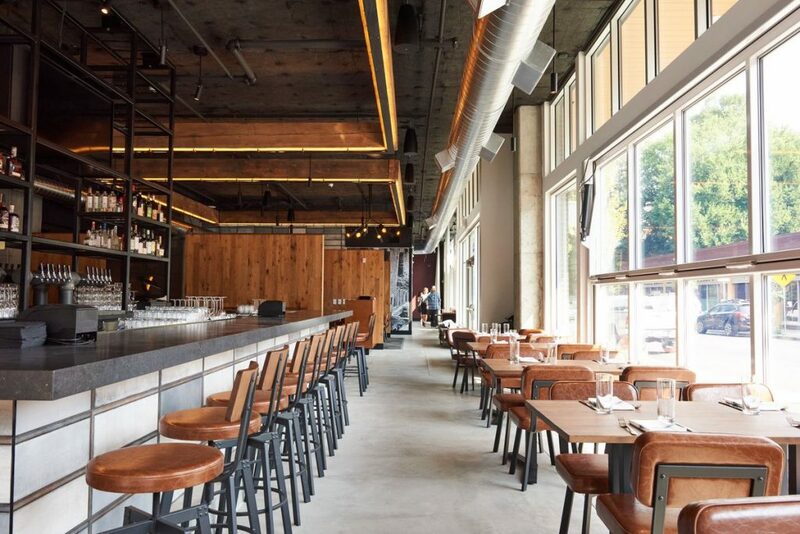 Eater Portland’s Mattie John Bamman names Tanner Creek Tavern, our newest restaurant opening September 12. Mark your calendars.